Saturday morning we woke in Palmer, AK (about an hour’s drive north of Anchorage) to the snow still coming down (see photo from earlier today) and about five inches on the ground. We quickly decided, too, that both kids were too sick to go out for the morning and rest was more important. I changed our plans with the person we were meeting and headed out for lunch with her by myself. At a great little cafe, I met Tonya, who used to babysit me when I was quite small, just a little older than Levi. It was sad I couldn’t bring my family along, but we had a great time catching up and it was fun to get together – she also loved to hear about our lives in Congo and our ministry there, so I shared as much as possible. Thanks for the great lunch, Tonya! That afternoon we headed out to Anchorage and, though our plans changed last minute, we ended up having a great family dinner with lots of focus on the kiddos, who were already showing signs of improvement. 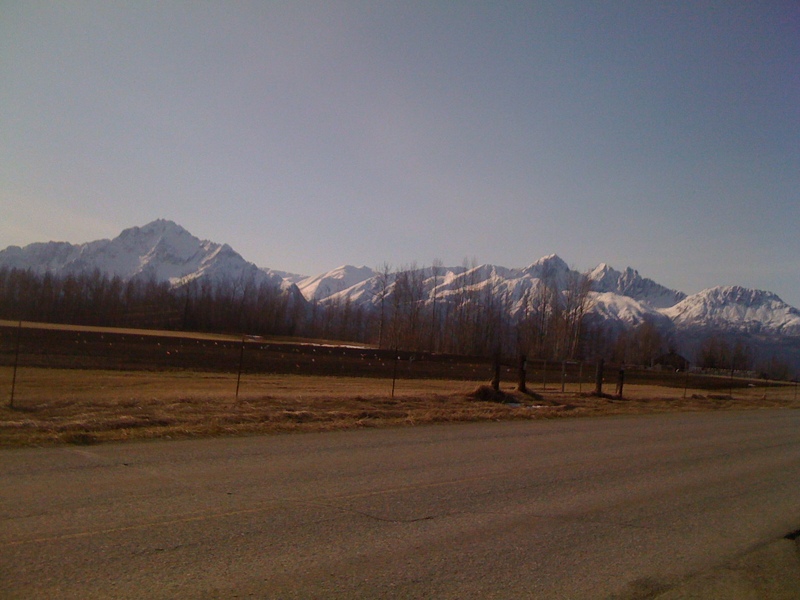 The drive to and from Anchorage is beautiful – all carved out between sky-high mountains covered in snow, though most of the snow from earlier in the day had already melted at sea level. Sunday morning we went to church with our host family. The church they attend is small and meets in an office, but what a fantastic and fun group of families! We shared with them during the morning service and answered questions. After the service there was a potluck and we stayed for a long time to chat (and EAT) – and lots of kids for our kids to play with. It was a really great time! That afternoon Amelia and I crashed for a long Sunday afternoon nap and we had a great dinner with our hosts and their neighbors. This morning Matthew and I headed out by ourselves to meet with an adopting family who live a few hours south of Anchorage and wanted to meet us in the middle. They haven’t traveled to Congo yet so we were able to answer questions and describe life and culture in DRC to the best of our ability. We shared pictures of Congo while they shared pictures of their boys over tasty breakfasts of reindeer sausage (Blitzen and eggs, as Matthew called it). We really enjoyed chatting with them about the fun similarities between life in Congo and life in Alaska (there are more than you’d think!). This afternoon was some of that wonderful computer work as we continuously prepare for our giant road trip. Tomorrow we are on a plane back to western WA for two weeks before hitting the road for the next four months. This trip to AK has been a blast, though a bit chillier than we’d hoped, but we will miss our friends and church families here as we say goodbye for the next four years. Please pray for our health – we cannot kick these colds and seem to be continuously in one stage or another of them – we’re hoping some warm weather will fix it! Please pray for safe travels tomorrow and that our plans in WA will be well laid out. Pray for our team in Kinshasa – about half of the families are preparing to leave on furlough, leaving short staff on the ground and lots of people traveling. Thank you all for your continued prayers and for those of you who have chosen to begin supporting us! If you haven’t recently, check out our updated support status page to see how we’re doing! Just around the corner from our hosts’ house in Palmer. Beautiful! I had so much fun hearing all about your life and the kids and your life in Africa. I’m amazed at all you do and how you live in Africa and absolutely loved looking at your pictures. Thank you so much for taking time out of your day to share with me!